Cheap flights to USA: Washington, Boston & Philadelphia for €356! Delta, KLM and Air Canada now offer really cheap flights to USA from Austria. 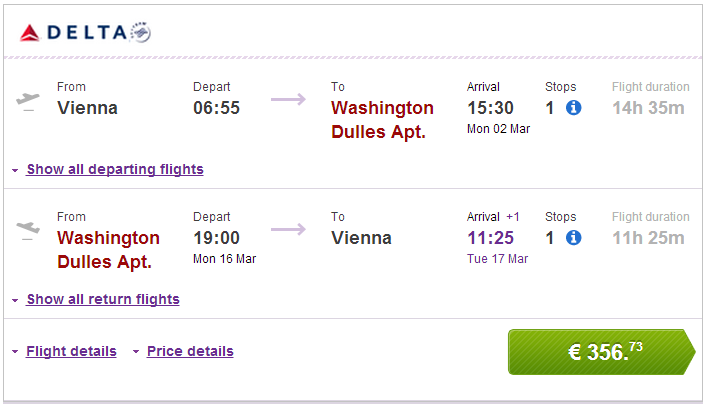 Return ticket from Vienna to Washington will cost you only €356! You can also fly to Boston or Philadelphia for similar price! There is 1 stopover in Amsterdam, 23 kg luggage is included. Travel dates are from January until March. Book your tickets fast via Vayama to get this great price! Check out best hotels in Washington here by comparing over 30 booking sites at the same time. It is a good idea to rent a car and explore whole East coast or even inland United States. Renting a car is quite cheap in the USA too so check the rates to get the best prices. « Cheap last minute flights to Dominican Republic: only €331!